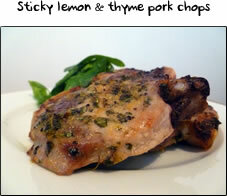 4 tablespoons of chopped fresh thyme leaves spread on a large plate. Some ingredients are just meant to be together and roast pork with cider is a great example. This is a great dish if you're looking to make a little more effort, but the rewards will be worth it. Pork tenderloin is such a succulent cut that it lends itself perfectly to the addition of a mushroom stuffing. This is a three part recipe. 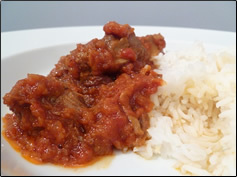 In part one I show you separately how to tie up a joint of meat using a roll of kitchen roll! It's worth practicing this before you cook the dish. In part two we prepare and tie up the actual pork. In part three we finish everything off and serve. This is a stand alone video to show you how to tie a joint of meat. If you already know how to do this, then skip this part. If not, practice a few times (it's really easy). Click here! Before you start, Preheat your oven to 180c and have everything out and ready other than your sieve & small saucepan for the sauce. Put saucepans for the carrots and potatoes on the hob with salted boiling water. Put your small frying pan on a low heat and click here! 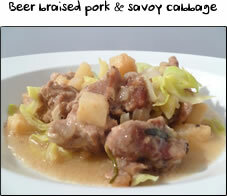 Before you start, take the pork out of the oven, have the cider, milk, butter & cream to hand and click here! Preheat your oven to 180c and have everything out and ready other than your sieve & small saucepan for the sauce. Put saucepans for the carrots and potatoes on the hob with salted boiling water. Put the small frying pan on a low heat and you're ready to begin. Firstly you need to blitz the mushrooms in your food processor, so pop them in and add a pinch of salt and pepper. Blend these for 5-10 seconds until they're all finely chopped. Take the mushrooms over to the hob, add a little swirl of oil to the pan and empty the mushrooms in. Give it a stir and turn the heat up to high. All you're doing here is getting rid of the moisture in the mushrooms. Keep moving them around the pan for 3-4 minutes until they're dry in the pan. Turn the heat off and remove the mushrooms to a cold plate to cool down. Next it's time to tie the joint, for which you'll need 3 pieces of string. One piece of that's roughly 2 x the length of the pork. One piece that is 2 x the width of the pork, and one long piece that's about 4 x the length of the pork. Lie the pork next to each other, as you would bread when making a sandwich. 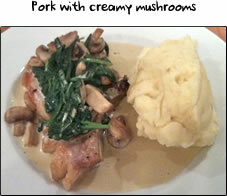 Season the pork on the side facing you and then add the mushrooms to one of the pieces of pork. Using your fingers, shape the mushrooms into a rough sausage shape in the middle, as in the first photo on the right. 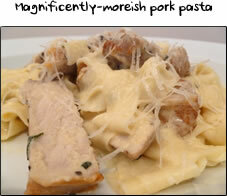 Next put the other bit of pork on top, as if you were making a sandwich and it's time to tie it all up. Take the first bit of string (2x length) and run it under and over the length of the pork, with the ends of string meeting at one end of the pork. Pull it nice and tight and then tie the string - second photo on the right. Next you need the second piece of string (2x width) and at the opposite end that you just knotted, run the string around the joint, pull nice and tight and knot the ends. Next take the remaining piece of string and tie it to the knot that you've just made. Now using the line of string along the length as your guide, pull the string about an inch along the pork, then put your finger on the string to hold it in place, before looping the string around and under the pork. Loop the string under where your finger is and pull gently, as in the third photo on the right. Repeat this pulling and looping every inch or so, along the pork until you reach the end. Pull tightly and tie the string to the loose end of the first piece of string. Trim the ends of the loose string, but don't cut the knots! Give your hands a wash and then take the pork over to the hob. Put your roasting tray on a high heat, and then season the outside of the pork with salt and pepper. When your roasting tray starts to smoke, add a swirl of oil and add the pork. All you need to do here is get some colour on the outside. Turn the pork after about 30 seconds and keep turning until all the sides are coloured slightly. Turn the heat off and put the pork back on the board it was on a minute ago. Take it over to your work surface and and bring in your english mustard. Using your pastry brush, liberally apply the mustard all over the pork. Next you need to roll the pork over the thyme leaves until it gets covered in thyme. Put the pork back in the roasting tray and then give your hands a little wash. Put the pork in the oven for 45 minutes. Put the potatoes and carrots into the pans of boiling water and cook for 15-16 minutes until the potatoes are soft enough to mash. Drain the potatoes and leave them back in the pan until the pork is done. When the pork is done, remove from the oven to rest on a board. Put your roasting tin on the hob on a high heat and pour in your cider. Give the tray a scrape with a wooden spoon to get the nice caramelised bits from the bottom of the tray. Leave this to come up to a boil and bubble away whilst you make the mash. Turn the heat on low on both the carrots and potatoes. Give the mash a good pummeling with your masher until you've got rid of all the lumps. Next add in a knob of butter and stir until melted. Give the carrots a stir to check they're not sticking. Adding a dash of milk at a time, stir the potatoes until you have a nice creamy consistency. Add a pinch of salt to both the mash and carrots. Turn the heat off the mash & carrots and take them over to your work surface, bringing back your sieve and small saucepan. Carefully pour the cider through the sieve into the small saucepan and then turn the heat on low. Add in the single cream and stir it in. Turn the heat off and take it over to your work surface to serve. To serve, untie the pork, making sure you get rid of all the string. Slice into 6 slices and carefully lay them three per plate, overlapping on one side of your plate. 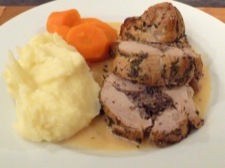 Add a nice dollop of mash and some carrots to the other side, before spooning some of the sauce over the pork. And you're done!